"It's a Major Award. I won it!" 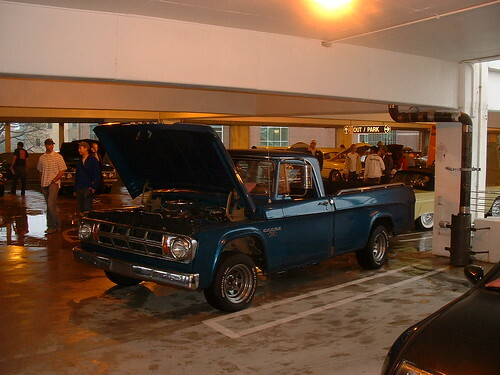 I entered old el trucko in the Georgia Tech Auto Show in the student beaters category. It won the category! 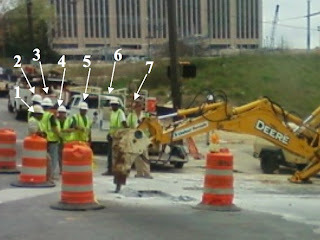 Seven guys to watch a backhoe in Midtown Atlanta. Don't break a sweat fellas! Working on the Sweptline again so I can use it more while I have the Daytona down for some needed R&R. Plus, we're planning on using the Swepty as the get-away vehicle for the wedding, so it needs to run well. 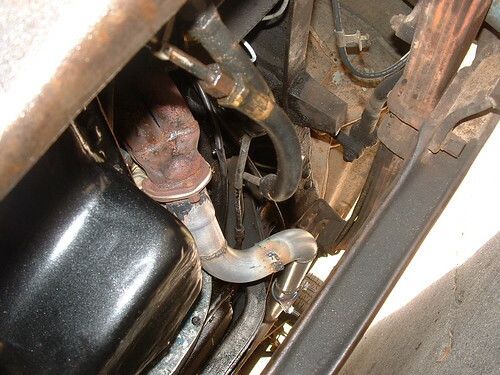 The swiss-cheese style exhaust was replaced in the '68 when the motor and trans mounts were broke and the engine and trans were in the incorrect spot. Of course, I didn't realize the mounts were broke, especially the engine mounts since they are pushed down by the weight of the 440. 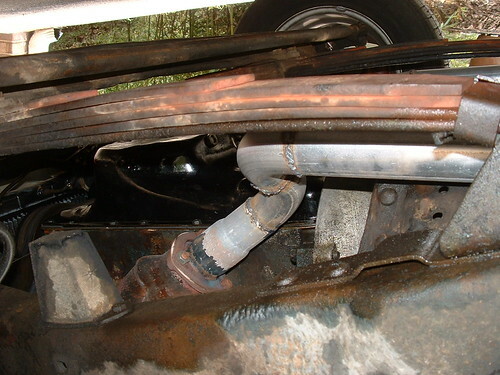 Long story short, once I went to replace the broken mounts, the exhaust hit the frame meaning I could not position the engine and trans into their correct location (this also resulted in a second broke trans mount). This weekend I finally had the time and the weather to fix it. Matt has a welder and a chop saw at his house, and I don't. But first we had to replace the starter in his '74 Dart because it was blocking the garage. So we dropped the drag link and pulled the starter on Saturday evening. We got the starter in and also installed new cables to the starter since the old ones were shot. We got the drag link back in but didn't have cotter pins so we left it on the jack stands. We finally got the SOB started. It had been sitting for a long time and had a rebuilt carb that had never been adjusted. So we finally got it started and the carb adjusted. We got up Sunday and made the first run to the parts store for the cotter pins. We got the pins installed and got Dart back on the ground. The car really wants to bog down and die because all 4 brakes are locking up. But we finally got it moved out of the way and the old Swepty down to the garage. We got it in the air, cut the offending exhaust section out of the way and then spent a while looking at just how badly the exhaust shop had bent the tubing. Yuck. He had shoved one pipe so far up in the collector on the shorty headers that I'm surprised 2, 4, 6, & 8 could breathe at all. I'd already purchased two mandrel j-bends from Summit so we went inside and drew out what we needed to get from the parts store for the 2nd trip of the day. 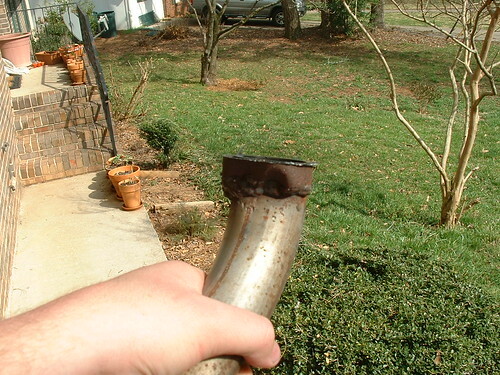 Luckily, I was able to salvage the collector reducers. Somehow we only made two trips to the parts store on Sunday. Normally, when working on something like this we make half dozen. What can I say, proper prior planning prevents piss poor performance. About the only thing we could have used was shielding gas or wire for use without shielding gas. 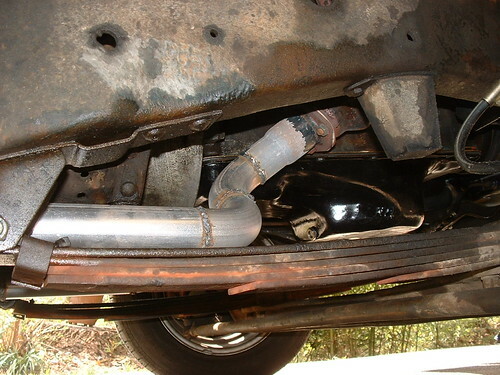 As it is most of the welds are ugly because we didn't have either, but it is exhaust so I don't really care. 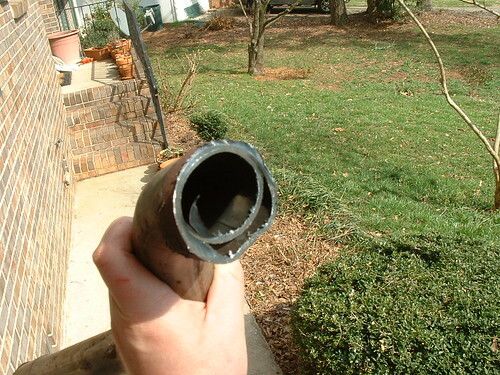 I don't have a picture of how far the guy had the tube shoved up into the collector but this a picture of how badly he'd bent some of the pipe to try to make it work. We then unbolted the mounts, dropped the truck on the ground, jacked up the engine and trans, pushed the truck forward, and dropped the engine and trans back into the correct position. 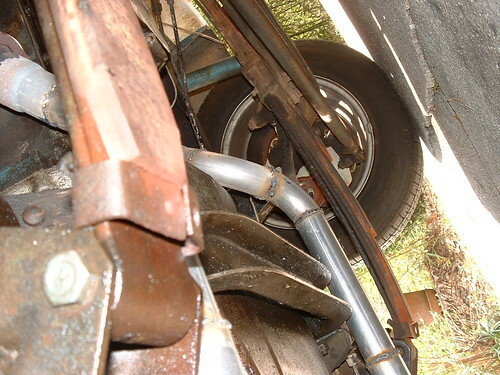 We then jacked the truck back up, bolted the engine and trans back down, and then started working on the exhaust. So here's some of our handy work to fix it. We cut the ends off the j-bends and then cut the resulting u shape in the middle to make two 90's. We figured you can make just about anything work with two 90s. We used a reducer off the collector rather than a but weld, though there are several but welds in this. 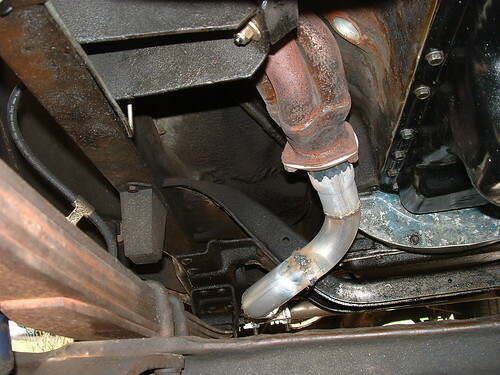 Plus, where this snaky section attaches to old pipe is just clamped together, which should make it easier to drop the trans by itself if I ever need to do this. The above shot shows the cross brace we have to snake around. 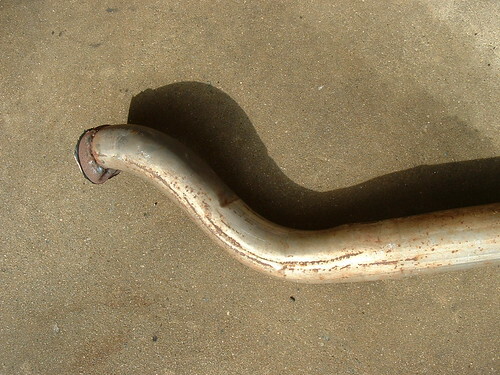 Only one manufacturer makes long headers for the '68 and earlier Sweptline and they are over $500. This stupid cross brace makes all the difference and is why I don't have long headers. After we were done we went on a short test drive that used about an 1/8th of a tank of gas. :-) Much better! Then I drove about 50 miles back home and used another 1/8th. Old truck gets outrageous mileage as long as you can keep the secondaries closed. But then again, they say JagYouAre, claim we say JagWar, but then it is spelled Jaguar. I mean, how do you say it? I've been working with a famous I/O psychologist the past few years on an article that points out a significant gap in our statistical techniques. We were nearing the end phases of the project when I realized we had an incorrect citation. I got the correct citation and did a forward search on it using Web of Science to see if anyone had actually done what this author had suggested oh so many years ago. Well, of course they had. In fact, the area has its own name and a ton of articles. What a crappy day. I found out that I've wasted a ton of time over the past couple of years working on the paper and I also found out that one of my idols does not walk on water. I'm glad I already planned on working on cars this weekend rather than anything that would make me think too hard. It is going to take me a bit to get un-pissed over this.